Lucy, a hound-beagle mix, lives for meal time. All of her indulging has led to dramatic weight gain — more than 30 pounds. "I am ashamed," Lucy's owner, Celia Craze, told The Early Show veterinary correspondent Dr. Debbye Turner. "There's no good way of saying, 'Look, I let my dog double in size.' "
Lucy's veterinarian, Dr. Laura Lathan, told Craze that she must put Lucy on a diet and give her some exercise. "Lucy is grossly obese," she said. "Obese dogs on average die two years sooner than dogs that are of a healthy weight." 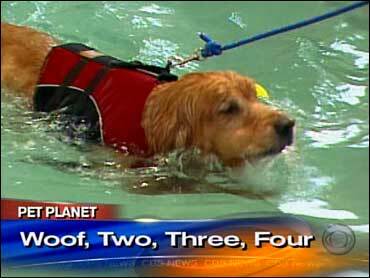 Craze heard about the Canine Fitness Center, where dogs can swim laps to lose weight. "She wags her tail the whole time," Craze said. "I don't know if that's because it's her rudder or that she's enjoying it. She doesn't try to get out as much." When Lucy first started, she had to take frequent breaks. But now she swims like a champ three times a week. "I walk for 15 minutes around the pool and she swims, so we both get exercise. So it's exercise for the family. It's great," Craze said. Lucy is by no means the only swimmer. Canine Fitness Center is a gym just for dogs. According to the Association of Canine Water Therapy, there are 25 registered dog gyms across the country. Lynn and Maury Chaput opened Canine Fitness Center seven years ago. In that time more than 1,500 dogs have come to take the plunge. "We include the parents," Lynne Chaput said. "We want them cheering the dog on. So it gets a little bit loud and little bit of splashing and little hectic." "It's amazing to watch, especially a first time dog, who is extremely apprehensive in the first two or three minutes, but by the time the session is over, they're jumping off the side, going under water. And they're having a good old time," Maury Chaput said. Lynn Chaput said swimming is better than taking dogs for a walk because it is a non-weight bearing exercise. "So if a dog has problems with its knee or had arthritis, they're getting the exercise in water," she said. "And that's the best things for them." Scout the golden retriever had difficulty walking because of hip dysplasia. After four months, he's walking better and losing weight. But not every dog likes to swim. "I have found that every dog can swim but only about 99 percent of them will swim," Maury Chaput said. In that case, Canine Fitness Center has a treadmill, which is most often used by show dogs for gate training. All of this extra care boils down to people doing everything they can for the health of their best friends. "I am going to do what we need to do to keep her healthy," Craze said. "And if part of it means having to get her some specialized fitness, then that's what I'm going to get her." For more information on gyms for dogs, visit Canine Water Therapy and Canine Fitness Center.